Dwight David “Ike” Eisenhower (October 14, 1890 – March 28, 1969) was the 34th President of the United States from 1953 until 1961. He had previously been a five-star general in the United States Army during World War II and served as Supreme Commander of the Allied Forces in Europe; he had responsibility for planning and supervising the invasion of North Africa in Operation Torch in 1942–43 and the successful invasion of France and Germany in 1944–45 from the Western Front. In 1951, he became the first supreme commander of NATO. Eisenhower was of Pennsylvania Dutch ancestry and was raised in a large family in Kansas by parents with a strong religious background. He attended and graduated from West Point and later married and had two sons. After World War II, Eisenhower served as Army Chief of Staff under President Harry S. Truman, then assumed the post of President at Columbia University. Eisenhower entered the 1952 presidential race as a Republican to counter the non-interventionism of Senator Robert A. Taft and to crusade against “Communism, Korea and corruption”. He won by a landslide, defeating Democrat Adlai Stevenson and ending two decades of the New Deal Coalition. In the first year of his presidency, Eisenhower deposed the leader of Iran in the 1953 Iranian coup d’état and used nuclear threats to conclude the Korean War with China. His New Look policy of nuclear deterrence gave priority to inexpensive nuclear weapons while reducing the funding for conventional military forces; the goal was to keep pressure on the Soviet Union and reduce federal deficits. In 1954, Eisenhower first articulated the domino theory in his description of the threat presented by the spread of communism. The Congress agreed to his request in 1955 for the Formosa Resolution, which enabled him to prevent Chinese communist aggression against Chinese nationalists and established the U.S. policy of defending Taiwan. When the Soviets launched Sputnik in 1957, he had to play catch-up in the space race. Eisenhower forced Israel, the UK, and France to end their invasion of Egypt during the Suez Crisis of 1956. In 1958, he sent 15,000 U.S. troops to Lebanon to prevent the pro-Western government from falling to a Nasser-inspired revolution. Near the end of his term, his efforts to set up a summit meeting with the Soviets collapsed because of the U-2 incident. 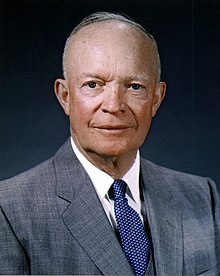 In his 1961 farewell address to the nation, Eisenhower expressed his concerns about future dangers of massive military spending, especially deficit spending, and coined the term “military–industrial complex”. A sense of humour is part of the art of leadership, of getting along with people, of getting things done. People want peace so much that one of these days government had better get out of their way and let them have it.